Do you have a friend whom you can call at midnight and vent your troubles to? Keep her/him close. Do you have a friend who gives you constructive criticisms and helps you hone your craft? Keep her/him even closer. Do you have a friend whose relationship with you seems to consume every part of your being? I am not talking about a friend who is going through a difficult situation and hence behaving weird. No. I am talking about the kind of friend who gets upset for no reason, never seem to understand your point of views, is always playing the victim and even acting out in public. You do? Walk away. Walk away from relationships that give you nothing but heartache. Please know that this could be a very difficult step and needs to be thought out properly. Walking away will set you free, give you some peace of mind and time to reset yourself. If you feel you said no to the wrong friend, you can always apologize and go back. But if you said no to the right person, bravo! 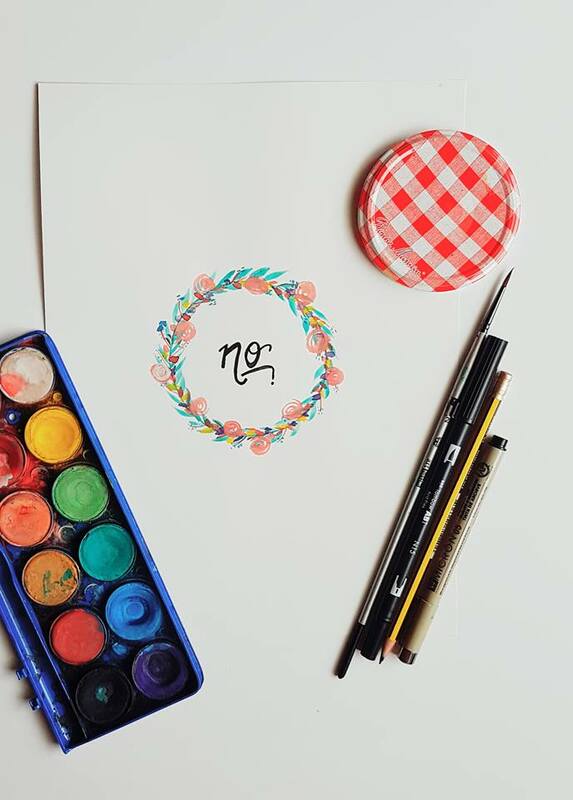 Learning to say NO to unnecessary meetings, parties, chats, phone calls, anything that distracts you from being productive and hinders your day to day work is crucial. A two letter word with so much power! Start using it well today. This is my first ever watercolor wreath! I have never been good with paint and brush and I did this! Except for the circle, rest are no-line watercoloring! It isn't perfrect but I love it. I sat on my couch and teared up once I finished. Hi Neelu! I have been to this space before too. But haven't been lately. Your water color wreath looks very neat and artistic to me. I would'nt have known it is your firs time with freehand with waterpaint. Let me think, ehhhh.. the last time i used the real water color was back in 4th grade? LOL! Now you have all digital versions - but a brush and the paint palette that stains your hand and is matchless and priceless!